Since the beginning of the sixteenth century, there has been much purposeless controversy over the … so-called “baptism” of the bells. Protestant critics, following the lead of Luther himself, have professed to find in the rite not only superstition but a profanation of the sacrament. But one might as well be scandalized at the ceremonial usually followed in the launching and christening of a ship. The phrase “baptism of bells” is merely popular and metaphorical. It has been tolerated, but has never been formally recognized by the Church. (Benedict XIV, Instit. 47, n. 33). Every Catholic child is aware that the essence of the Sacrament of Baptism consists in the form: “I baptize thee etc.”, but no properly authorized ritual for the blessing of the bells is known to have contained any phrase which can be regarded as an equivalent or parody of these words. … On the other hand, the ceremonial of the Church is often imitative. The rite for the blessing of palms closely follows the arrangement of the variable portions of the Mass. The order for the coronation of a king copies so nearly that for the consecration of a bishop that Anglican writers recently (i.e. in 1907) contended the king is a “spiritual person” invested with episcopal powers. Hence it would not be surprising that in the (blessing of a bell) certain resemblance should be traced to details in the ritual of baptism. Exorcisms are used, and water and salt and unctions with the holy oils; the bell receives a name, and formerly, at least, the name was suggested by a “godfather”. But for all the controversy the resemblances are really very superficial. … That the ritual for the blessing of bells, which has thus been in use in the Church for nearly twelve hundred years, was framed with any design of imitating the ceremonies of baptism seems highly improbable for many reasons. First there is no triple immersion, nor strictly speaking any pouring of water. The bell is “washed” by the bishop and his assistants, just as the altars are washed on Maundy Thursday. Further there is nothing whatever to recall the ephpheta ceremony, yet this is the one detail in the rite of baptism which would seem in place if the ritual were transferred to a bell. Three bells set into place for their ‘baptism’ in the church of Saint John the Baptist in Mollau, France, in 1949. Note that the name to be given to each bell is written above it on the decorated arch from which it is hung. The rite has undergone no essential variants. … The seven penitential psalms, which opened the function, have been omitted. The washing of the bells, which was suggested by the medieval concern to structure the consecration of a bell like a baptismal rite, has also been abolished. There remains, on the other hand, the sprinkling of the bells, accompanied by the singing of Psalm 28, which is done responsorially. The notes go on to mention that the oil of the infirm is no longer used on the bells, an element introduced in the Middle Ages because one of the purposes of a bell “is” (not “was”) to announce an impending death. No mention is made of the change to the blessing of the water, the shortening of the prayers, or the abolition of the Gospel at the end. The incensation of the bell is mentioned as if the manner of incensing it had not been completely altered in the 1961 revision. It may be further noted that the “seven penitential psalms, which opened the function” in the Pontifical of Clement VIII, were not in fact the penitential psalms, although two of them also are among the penitential psalms. 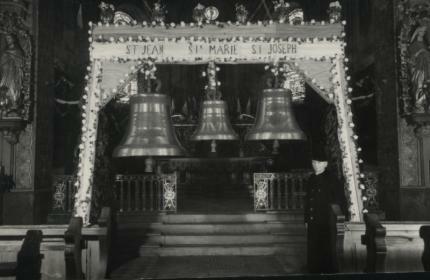 It is difficult to see how the sprinkling of the bells “remains” in the ceremony, since it was not there in the first place. Likewise, no mention is made of the reason why Psalm 28 and its antiphon, “The voice of the Lord is upon the waters; the God of majesty hath thundered, The Lord is upon many waters.” are sung during the blessing of a bell. They occur in this ceremony as far back as the Pontifical of Archbishop Egbert of York (732-66 A.D.), and always accompany not the washing, but the anointing of the bell, seven-fold on the outside, and four-fold on the inside. The seven anointings correspond to the seven occurrences of the words “vox Domini – the voice of the Lord” within this psalm; indeed, the 10th-century Pontifical of Mainz directs the bishop to make each one of the seven crosses exactly as these words are being sung during the psalm. The rubrics of subsequent Pontificals (Durandus, Piccolomini-Burchard, Clement VIII) are uniform in mandating seven crosses on the outside and four on the inside. Fr. Thurston does not overstate the case when he says that the ritual of the blessing of bells in its substance goes back twelve-hundred years. Unfortunately, the practice of mangling the source materials like this when revising the liturgical books would become even more common in future years. 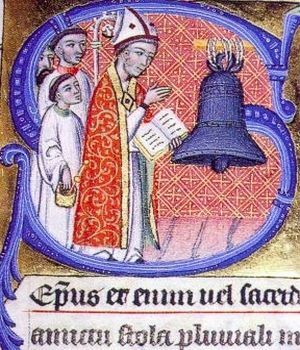 An illustration of the blessing of a bell from a medieval Pontifical.